This place is currently under new ownership. Much cleaner and better security is in the works. Been to this venue many many times with bands preforming and to see many as well. Saw Donnie Iris there, Motorhead, Angel City, Toby Red, etc. I worked with the D. C. Hawks who played there a few times also. And I am pretty sure The Motor City Rockers played there as I worked with them too. Harpo''s definately was a great place to see a show. and they are still rockin over there. Check out there site: http://www. harposconcerttheater. com. I started there in 1979 and worked in the ticket booth with Pat, I was there the first days Harpos''s went from Disco to Rock-n-roll. I recall when Huey Lewis came to town someone had filled a video of him in the bathroom at the hotel with his group, later to be showed on the big screensBoy there was some great there. John M. Heyka: I worked here as a bouncer in 84-85. I think the building might have been built in 1937, not 1939, due to a certificate of occupancy issued by the city dated April 1937 which was located in the boiler room in the basement. On of my jobs was to fire up the beast on cold days. Occasionally, Id have to scrub the heat tubes inside the boiler, which had been coonverted to natural gas. But you could still see the coal chutes on the back wall of the building facing the alley. Above the set of steps leading to the second floor offices was a Gibson Byrdlland guitar used and autographed by Ted Nugent. Needless to say, the guitar was attached to an alarm. The original projection room was still there, projectors included. I was told threy still worked then, as they were used to show an adult film made by an actress who appeared there. The room next door included a shower which was still in use. The highlight though, was a private party room for celebrities and rock and roll vips, which had windows on one end that faced the stage below. From there you had a commanding view not only the stage, but the whole house! On the mezzanine level were the bathrooms(no doors on the stalls), the candy counter, pool and foosball tables and video games. Inside the room are several levels, each lower than the other. Theres a main bar, one bar on each side of the dance floor and a jumbo video screen above each bar. The dance floor is of course lit. In the bottom or pit level, there used to be a bar and the stage had to be raised four feet or so when it was converted from a disco bar(its original use) to a rock and roll bar. It was either that or to keep people from jumping up on the stage. Some still managed, though. I remember Spencer Davis (of the eponomously named group) talking to Mitch Ryder on the phone about the formation of the Spencer Davis Group. Even watched him play pool at the end of the night with the owners. So many memories, so little time. If you like, I waxed a little more nostalgic on a related site called Motor City Rock. Ah, those were the days!!. In 1975, I had a crush on a girl named Ramona who worked in the box office here, while I was a doorman down the road at the Vogue. I have few more tidbits of info. Check the link on this website to Harpos and the website Motor City Rock. 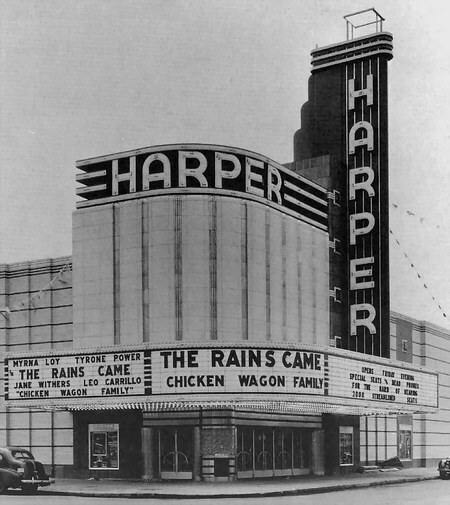 Greetings, the Harper Theatre still stands today, but the name of the venue has changed to Harpos Concert Theatre. This facility had showcased and headlined many of the major rock and roll acts of the 70s and 80s. The interior had been altered to accommodate several bars, a large dance floor, and festival seating. In the late 70s and early 80s, I worked as the promotion director for radio station, WABX-FM. The station sponsored numerous concerts including, the B-52s, James Brown, Grace Jones, Iron Maiden, Mountain, and Jack Bruce, to name a few. Local bands such as Adrenalin, Toby Redd, the Almighty Strut, the Look, graced the Harpos stage. Recently, Harpos has continued to feature cutting edge groups on the weekends. Opened in 1939, for the Wisper and Wetsman circuit, the Harper Theatre was designed by N. Agree in a stunning Art Deco style. The theater was complete with a towering 80-foot vertical marquee spelling out the theater's name (which could be seen for blocks up and down Harper Avenue) and lit up at night in multicolored neon lights. 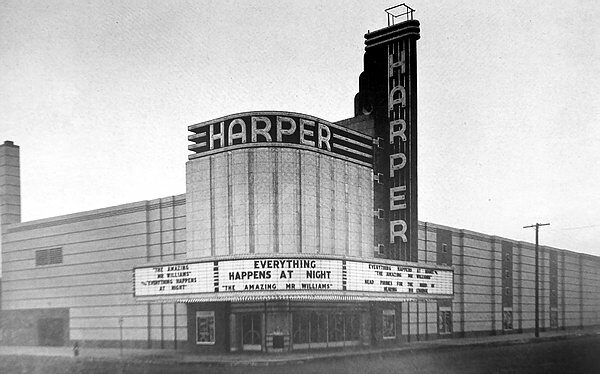 The Harper cost about $290,000 to build, and was at the time one of the most modern-looking theaters to open in Detroit. It also featured murals in the lobby and auditorium by Thomas di Lorenzo. Opening week films included 'The Rains Came' and 'Chicken Wagon Family'. 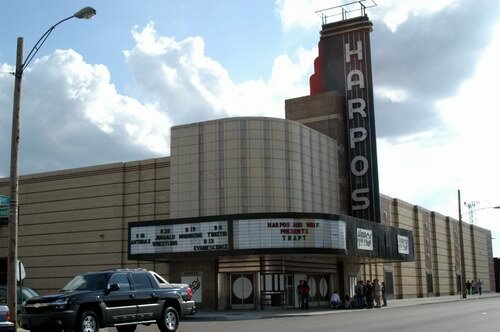 It was converted into a nightclub in the 70s, and currently is home to Harpos Concert Theatre, the premier venue for heavy-metal and industrial rock bands in Detroit. Cinema Treasures Link. I worked there as a usher in high school. That was in 1972-73. It sat 1499 people and i remember it full only a couple of times. My buddy streaked down the main isle and out the back door stage left so to speak, Myself, i rode my ten speed down the center isle and found my brakes didnt really work that good. thank god the stage was there to stop me. This was my first real job, and at $1. 25 an hr. i would make about $22. 00 bucks a week. I saw the movie BILLY JACK 24 times. I drive by it now and then and just smile for the fun i had working there. Its now HARPOS. I wonder what ever happened to Mary.